"Sampath Speaking" - the thoughts of an Insurer from Thiruvallikkeni: freebie State or Welfare State and who garner more of subsidy - poor or rich ? freebie State or Welfare State and who garner more of subsidy - poor or rich ? When the happiness or misery of others depends in any respect upon our conduct, we dare not, as self-love might suggest to us, prefer the interest of one to the interest of many." – said Adam Smith [1723-1790] a Scottish moral philosopher, pioneer of political economy, and a key figure in the Scottish Enlightenment. Smith is best known for two classic works: The Theory of Moral Sentiments, and An Inquiry into the Nature and Causes of the Wealth of Nations. The latter, usually abbreviated as The Wealth of Nations, is considered his magnum opus and the first modern work of economics. There could be an ‘invisible hand’ – which in Economics is the metaphor used by Adam Smith to describe unintended social benefits resulting from individual actions. The phrase is employed by Smith with respect to income distribution (1759) and production (1776). The exact phrase is used just three times in Smith's writings, but has come to capture his notion that individuals' efforts to pursue their own interest may frequently benefit society more than if their actions were directly intending to benefit society. Welfare economics is a branch of economics that uses microeconomic techniques to evaluate well-being (welfare) at the aggregate (economy-wide) level. A typical methodology begins with the derivation (or assumption) of a social welfare function, which can then be used to rank economically feasible allocations of resources in terms of the social welfare they entail. Is Tamil Nadu, a welfare state ? – do you decry or praise to the hilt ‘Amma Unavagam’ … the food chains primarily serve South Indian food namely Idli, Sambar Rice, Curd Rice, Pongal, Lemon Rice, Curry leaf Rice and also Chapathi - - at unbelievable prices : Re.1 for an Idli, Rs. 5 for a plate of Sambar Rice and Rs.3 for a plate of Curd Rice, etc. 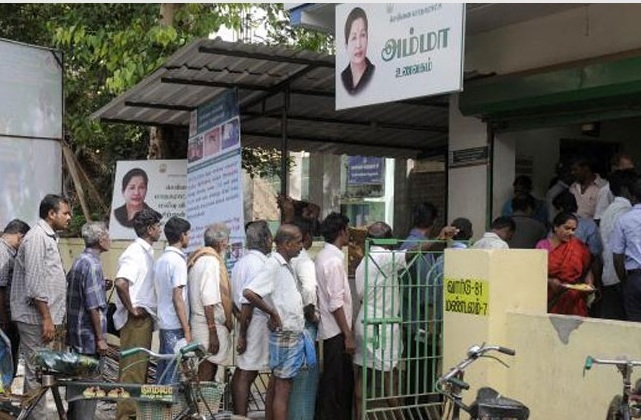 When TN CM turned 68, food was distributed free in these Amma unavagams. Though Tamil Nadu is widely regarded as relatively well-governed, the State spends an inordinate amount of money on sops. Given the State’s finances, the question being asked is whether governments should continue with the policy of giveaways. Over the past decade, successive governments in the State have spent nearly $2 billion (Rs.11,561 crore) on just three freebie schemes – colour television sets, laptops and household appliances. These sops are not acceptable even when the State had excess money to spend. But with the government’s own recent budget projections indicating weak financial health, questions do not get raised on whether the money spent on freebies over the last decade should continue and why not use such revenue for growth and welfare like creating better infrastructure for schools and primary health centres. The Survey classified the population on the basis of consumption data collected by National Sample Surveys. “Poor refer to the bottom 30 per cent of the population and the rich the top 70 per cent,” it said in a footnote. This categorises a sizeable portion of the non-poor as ‘rich’. Some commodities are subsidised more for the poor than the rich, such as railway tickets (since there are different categories of tickets), but even here, the rich avail of a subsidy of 34 per cent, according to the Survey. Similarly, the tax structure has resulted in aviation fuel being cheaper per litre than petrol and diesel. “Aviation fuel is taxed at about 20 per cent (average of tax rates for all states), while diesel and petrol are taxed at about 55 per cent and 61 per cent (as in January 2016). The real consumers of ATF are those who travel by air, who essentially are the well-off,” the Survey said. Among six commodities, the maximum subsidy to the rich is for LPG at Rs 40,151 crore followed by electricity Rs 37,170 crore, Kerosene Rs 5,501 crore, Gold Rs 4,093 crore, Railways Rs 3,671 crore and ATF Rs 762 crore. The rich consume 98 per cent of the gold in the country, and yet gold is taxed at only 1-1.6 per cent, according to Economic Survey. 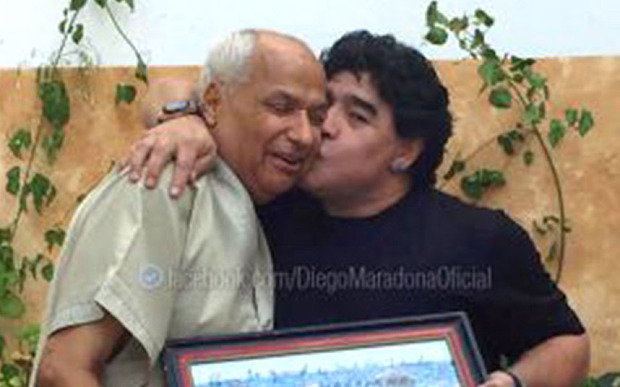 ~ if you are wondering what the photo at the top has to do with this post – it is Diego Maradona kissing and hugging the referee who allowed his handball goal in the 1986 World Cup. Maradona's quarter-final goal against England in Mexico City gained added notoriety when the Argentine, who tapped the ball over the head of onrushing goalkeeper Peter Shilton with his fist, claimed it had been scored by the invisible 'Hand of God'.